With its strong tradition in naval architecture, new-construction and retrofit, MCP offers its know-how and capabilities to offshore companies and commercial operators. 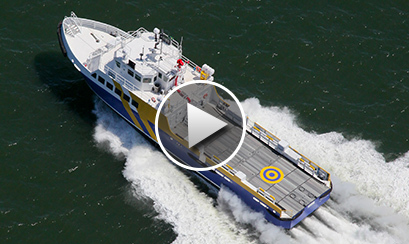 The shipyard also provides high-speed marine transportation solutions for a wide range of applications. In 2012, three 35 meters fast crew boats were built and delivered to Brasil Supply SA, a ship operator from Rio de Janeiro. Top quality designs from well-reputed offices as Damen and Guido Perla are available. Whether it is ship repair, shipbuilding for offshore, commercial or military purposes, MCP will always assure high quality and performance, reliability and easy maintenance, with on-time delivery meeting or exceeding even the most exacting standards.